If you're feeling as if the full selection is beyond you, then we are happy to cook you a bacon and/or sausage sandwich, eggs on toast, beans on toast or any other combination that you would like, just ask. 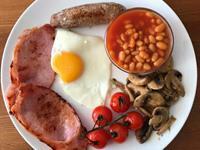 If you fancy a lighter breakfast, then Shaftoes has a few alternatives, but our home cooked pancakes take some beating! why not replace the fruit with a few rashers of bacon. We also make wonderful porridge, cooked from scratch on the stove, served with blueberries, ideal if you are planning that long walk or cycle. 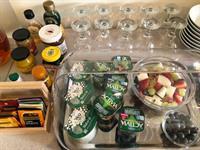 We also provide a buffet area, with fruit salad, juices, yogurts (flavoured and natural) and a wide range of cereals. Breakfast is served with coffee or tea (including an extensive range of flavoured teas), toast, condiments and usually a smile. We also have a wide range of products to suit gluten free guests and are happy to support anyone with allergies, but please do make us aware of these when booking.